The Touhou series is almost a decade old already in the doujin (non-commercial) community. It originally began its life on NEC’s PC-98 (which was essentially a PC with a few NEC-specific hardware standards, thus making it somewhat incompatible with other IBM compatible PCs at the time) and then carried over to Microsoft’s Windows-based platforms. The first game was an odd, yet interesting Arkanoid clone. The second was a shmup. The third was a Twinkle Star Sprites clone. Games 4-8 were shmups, with the 6th one being the first game developed for Windows under the name “Team Shangai Alice.” Phantasmagoria of Flower View, the 9th game in the series, is another Twinkle Star Sprites clone, except the amount of firepower directed at you in this game makes playing Twinkle Star Sprites on the Dreamcast without slowdown look like a cakewalk. These games are also the product developed by a single person who goes by the name of ZUN. Yes, this is the same guy who writes the plot, draws the graphics, does the character designs, makes the music, and creates the bullet patterns. What’s even more crazy is the fact that his games rival the quality of most commercial shmups: The music is catchy yet simple, the storyline is good (if far-fetched at times), the graphics look aesthetically pleasing without requiring the latest PC hardware to appreciate, and the bullet patterns are both challenging to navigate through and a sight to behold at the same time (although trying to do both at once will get you killed), not to mention these games can be bought for under 20 dollars (if you don’t count the obscene shipping costs, that is). ZUN also releases one Touhou game every year. Touhou Bunkachou, however, breaks this tradition. Then again, this game is supposed to be only a stand-alone supplemental to a book that was published around the middle of August 2005 that bears the same Japanese name but uses a different English subtitle. 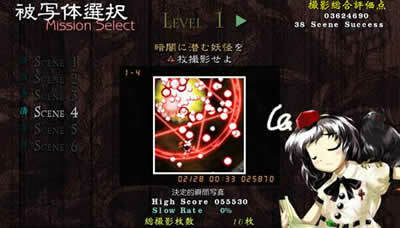 This is also the first game in the series where Reimu Hakurei (the main character of this series) neither makes an appearance nor is playable. book use the same Japanese characters for their title. Based of what translated material I did come across for Bohemian Archive in Japanese Red, the Tengu in Gensokyo are newspaper reporters. Aya Shameimaru doesn’t want to lose again for this year’s competition for the best newspaper, and Shoot the Bullet represents her wandering around Genksokyo taking pictures at locations where the events of the previous Touhou games took place in order to complete her newspaper. To find out more information about Gensokyo, check out the links presented at the bottom of this review. I was actually surprised the ZUN was able to improve upon his Touhou engine within a span of less than six months. Also, unlike Phantasmagoria of Flower View, where some of the character designs looked really, really odd (but the corresponding sprites were very good and were not recycled ones from previous games in the series), Aya’s design is very good. The menu screen has a graphical style which is pretty hard to describe in words, but the overall effect is reminiscent of an old black and white film, except that everything’s in color. The bullets are sharper, crisper, vibrant, and nowhere near as dull like in previous Touhou games. 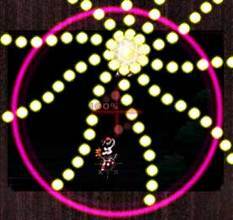 ZUN even goes crazy with some nice parallax effects for some of the boss spell cards. Although the game still doesn’t support TATE mode, the game makes good use of the sides by having your photo shots of the boss placed there. What’s great is that even though this is the best-looking Touhou game from ZUN yet, it’s also the most optimized of them all since the game runs at a smooth 60fps on my laptop’s outdated Radeon IGP 320M (it can’t even run Warcraft III at anything higher than 20fps at the lowest settings possible if you want a comparison). Although I had to set the graphical details as low as I could, I still didn’t see much of a difference after looking at how everything appeared at max settings on my desktop. If you’ve ever played any of the Windows Touhou games before, you’ll notice that ZUN has a preference for pianos and synthesized trumpets that play at unrealistic pitches, since in almost every song you’ll hear at least one of these instruments playing. Another signature trait of ZUN is that his music always fits the mood of whatever’s going on, and even though it’s all synthesized, the melody is pretty darn good. It’s the same case for this game, but the quality has reached the point where it reminds me of SNES RPG music. 東の国の眠らない夜 is easily the best song I’ve heard so far in this game, since it sounds like a major boss fight yet both characters are having fun at the same time. 天狗の手帖　～ Mysterious Note uses the same melody that fans are used to hearing during the Tohou title screens, except this time it opens with the sound of rain falling before the melody starts, which further adds to the mood of this game’s title menu. There is one problem I have with the music is that there’s not enough music tracks. In a normal Touhou game, there’s usually more than 10 song, and there’s two tracks used per stage. 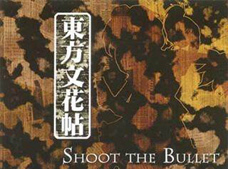 Including the title screen music, Shoot the Bullet only has six tracks, and it has more than six levels, with each level having its own subset of scenes to finish. One track is used for three entire levels, so if you die a lot, be expected to listen to the same track for quite awhile. The premise for this game is pretty straightforward. bosses from the Touhou series will appear. Get your camera’s charge to 100%. to take a picture of the boss. to your collection for that photo session. Repeat until you’ve taken enough pictures of the boss. Make sure to accomplish this within the time limit. Taking pictures with the camera when its charge is at 100% is your one and only attack. There’s no forward shot, homing shots, options, bombs, or powerups of any sort. You can’t even graze bullets for score like in the other Touhou games! The good news is that your camera can also be used to clear any bullets or other obstacles in your way if they were captured in the camera’s shot. Later scenes will involve you manipulating your camera to intentionally clear bullets before you can even get close enough to the boss to take a picture or to just prevent yourself from being overwhelmed by them, since taking a picture with a lot of bullets in it will set your camera’s charge at a higher percentage instead of starting at 0% after every shot. Once you get hit by either a bullet or the boss, you have to start the entire scene over from the beginning. 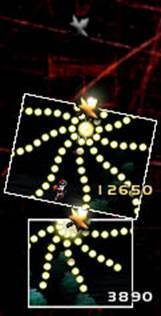 Sometimes you’ll end up having to take more than five pictures of the boss in order to finish the scene, and each successful picture will most likely increase the complexity of the boss’ bullet pattern, but ZUN assumes that we’re all as great as he is and that we can complete the scene without dying once. Don’t worry about not being able to clear a particular scene on your first few tries. Scene progression isn’t linear, so if you don’t like that particular one, you can opt to try another scene within that same level, or even go try any of the scenes in the next level (assuming you cleared enough scenes to unlock the next level, of course). Also, you don’t need to unlock all of the scenes in one level to access the next one, so don’t be afraid to jump all over the place and pick the scenes you’re able to finish, since sometimes the bottom scenes are easier than the top ones. Frustrated over a particular scene? Try another one and see if it’s easier for you. After unlocking every level in the game (which isn’t an easy task if you’re not a seasoned veteran at shmups, and even if you are, you’re still in for a rough ride), playing for score and showing off your replays are the only reasons for you to continue replaying the same scenes over and over. If you’re obsessed in getting all of your pictures during the most intense parts of the bullet patterns while risking putting yourself in with the boss who’s located dead center in your camera shot while getting as many bullets close to hitting you and capturing as many bullet types in the picture at the same time, the game encourages you to do that by giving you score bonuses for performing them. Not only that, but the best shot you’ve taken so far will be displayed when you highlight that particular scene, even if you failed to complete the scene at the time you took that shot. I was never really a fan of these kinds of shmups most likely because of the fact my first experience with it was Mars Matrix, and although there was a TON of bullets flying at you in that game, they can also be manipulated to do whatever you want within the limits of your ship’s special attack, which impressed me a lot. Ikaruga also tries to do something similar by having you absorb bullets of the color your ship is currently set to, forcing you to be precise on doing this to maximize the output of your special attack. 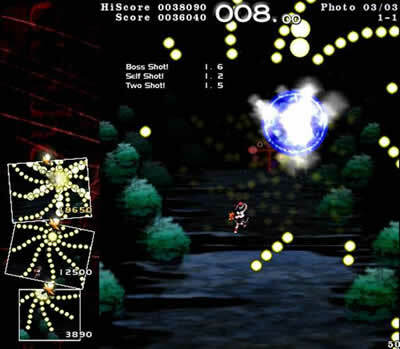 Shoot the Bullet attempts to try something new with the bullet hell/curtain fire/danmaku genre by introducing an interesting game mechanic I’ve never seen before, which is a cross between Mars Matrix (can’t use your special ability until it’s 100%) and Ikaruga (bullet capture to increase your camera’s charge). So if you want to try out something experimental within this genre of shmups, give Shoot the Bullet a try. You won’t be disappointed, and your wallet will definitely be happy about it. Touhou fandom is found outside of Japan as well, and there’s quite a lot of information on the Internet to be found. Here’s enough to get you started. 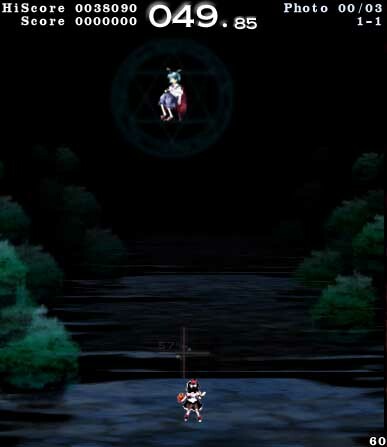 ZUN’s test replay of Level 7, Scene 8. The track playing is 東の国の眠らない夜. Notice that whenever Aya takes a picture, she doesn’t go into her picture-taking pose in this demonstration, which was probably added sometime after this video was released. Courtesy of Google Video. Maidens of the Kaleidoscope- Touhou news in English. The GD/ST of Shoot the Bullet- (look here for explanations of GD/ST) Located in the Maiden’s of the Kaleidoscope forums. 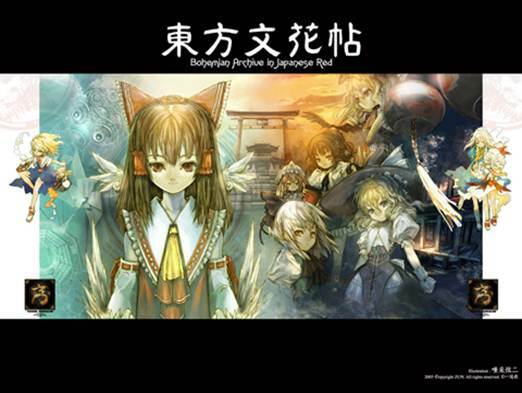 The Touhouwiki- Information about the game series can be found here, and anyone on the Internet can modify existing information or add new ones. Shoot the Bullet Spell Cards- Wondered why I didn’t put a lot of screenshots of the game in this review? The Touhouwiki has them all, that’s why. Want a copy of the game? Check out Himeya Soft if you don’t have PayPal, since their prices are a little steep. If you do have PayPal, check out Paletweb.